You’ve heard it correctly: it’s time once again for a review of the Friends Animals Collectibles (which is what I’m going to call them from now on). We’ve reached Series 5, and pictures of Series 6 have been spotted online, for anyone who likes having their surprises ruined. Again in numerical order, we’re going to be looking at Macaw’s Fountain. A macaw is, of course, what we immediately think of when we think about parrots. Like all the other Animals Collectibles, this set comes in a tear-proof bag – just like the Mixels! Bottom left is a picture of the main cast hugging up on the new animals. 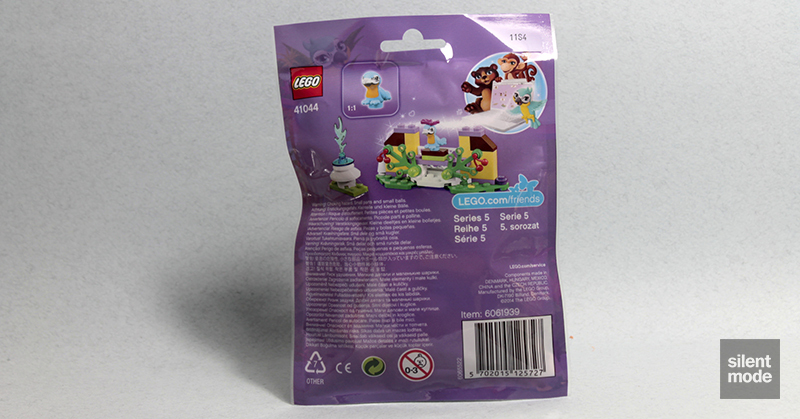 As usual, a little more information about the set is on the back of the packaging, including an alternate build. It’s great to see both these and Mixels reintroducing the concept of alternate builds, because goodness knows the next generation could use some imagination. Here are the entire contents of the set, minus the featured animal. Does anything jump out at you? How about those Bright Light Yellow parts at the front? What gets me going are those two 1x1x3 bricks, which for me are some really interesting parts. Many others aren’t fans of these “parts out of parts”, but I like them and will no doubt find them useful. Maybe it’s the Medium Lavender plates? The 1×2 plates have been in Pick-A-Brick walls in my neck of the woods, and as such I have way too many of them than I know what to do with. Or perhaps it’s that Medium Lavender 2×2 round tile on the right? It’s the new mould with the stud holder in the centre. Given that the “cuckoo” in Olivia’s Tree House and Jungle Tree Sanctuary is actually a parrot, it should come as no surprise that the macaw uses exactly the same mould, except it appears in Medium Azure. It also comes with a Magenta bow, for those who like that sort of thing. We will probably see doves in the near future – although they should really be a new mould – because past allusions to weddings have been made. This very simple SNOT build illustrates how a small water feature can be built, with the help of that new mould 2×2 round tile. Ironically it’s the most realistic water feature that’s appeared in a Friends set yet! This building technique could potentially be used to make chess pieces. You’re welcome. The macaw wants somewhere to rest its wings, so we get to work on this fancy structure right away. Note the use of an octagonal base (rather than a 6×6 square), and the use of those 1x3x3 bricks to make short work of building pillars. The quickly constructed roof of the gazebo uses the White 6×3 wedge plate, finished with a small dome. Of course, what would a gazebo be without some wild berries growing from it? We also get a couple of Trans Bright Green “Bionicle eyes” to help pin those plant parts down. So here it is: a very tranquil setting for the rare Sky Blue Macaw. It could be a shrine to the endangered species, a display in someone’s back yard, or a lonely exhibit at the zoo – you decide. 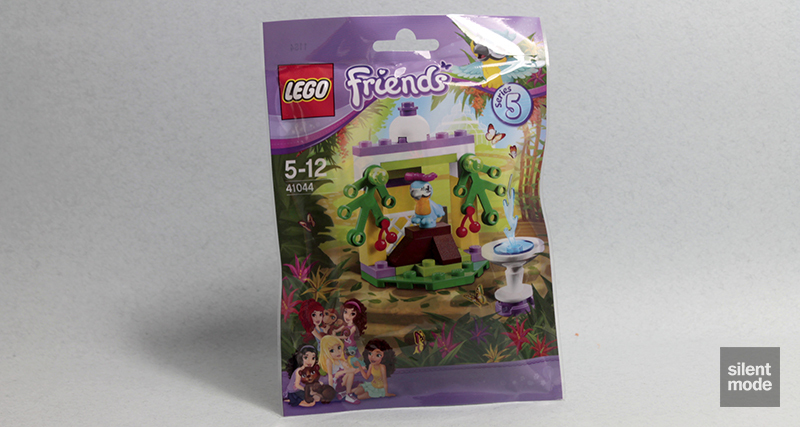 You should be able to find instructions for this alternate build on the Friends website. Since I’m an Elite Builder (Master Builders are soooo yesterday!) I was able to build this without instructions, although taking the original build apart always takes time. None of the leftovers are particularly useful for me, but you might like them. The spare Magenta bow is a given. There isn’t much to do with this set, except for building it and placing it on your desk at work, or perhaps displaying it as part of a larger collection or exhibit. It is a rather attractive display piece, however, helped greatly by the use of Bright Light Yellow and Medium Lavender parts. The best reason to get this set would be for those parts, as well as adding the macaw to your collection of Friends animals. Expect this one to fly 😐 off the shelves, compared to the others, especially when discounts start appearing. I’m giving this one 5.6/10.